Set in sixth-century Greece at the time of the Tyrants, the Persian Wars, and a great flowering of the arts, this novel takes the form of Simonides' memoirs, written in retirement in Sicily. The author was a fellow of the Royal Society of Literature, and she also wrote The King Must Die. It is remarkable how effective Mary Renault is in peopling the past with characters that we recognise and respond to. In The Praise Singer, she takes, as the protagonist, a figure from the sixth century BC, Simonides, about whom we know relatively little, but who is regarded as one of the great lyric poets of that period in ancient Greece. And yet, in her presentation, she makes him live fully and convincingly in our minds and imaginations . And Mary Renault's clear knowledge of that complex period of Greek history when all was in flux, is truly awe-inspiring. It is a fascinating and enlightening work. 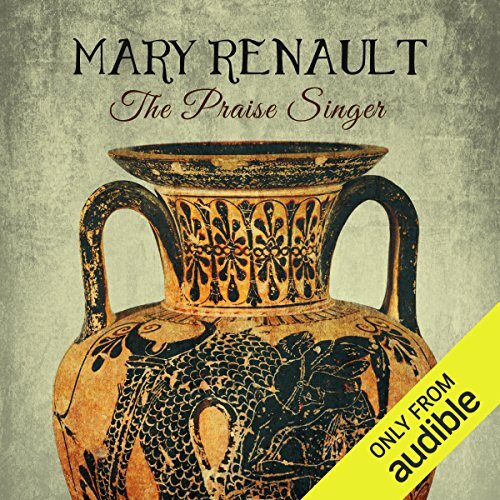 And in this audible version of it, all praise should be given to the narrator for his excellent reading of the text. He can nuance his voice, for the various people that we meet, in a most effective way, but for me, his skill came out most effectively in the various dialogues we hear: the continuing dialogue between Simonides and his brother; the great dialogue between Simonides and the hetaera, as well as others. It is a book Simonides would have found worthy of song. Have you listened to any of Tim Bentinck’s other performances before? How does this one compare? No! Timothy Charles Robert Noel Bentinck, 12th Earl of Portland. Bentinck has been an actor since 1976 and is best known for the roles of David Archer in the BBC radio. He is also a voice-over artist, having provided the voice of James Bond, the video-game. Bentinck has a wealth of theatre, television, and film credits. Audible credits him as narrator on 23 books as of this date. In doing this book he pulls off the old learned voice of Sim and the youthful voice of his pupil. He adjusts the age of his voice and pitch to the age of the character. My only criticism is admittedly knit picky. He pronounces many of the Greek proper and place names in the British formal fashion. It gives the names a little bit different tone and inflection than an American audience ear would want in order to process the sound correctly. However, this shortcoming can be forgiven because the author was British. For other readers sake, I hope Audible choose a different American accent narrator when they come to choose a narrator for “The Mask of Apollo”. We are cordially invited to dine and spend the evening at a symposium, held by Ms. Renault, for three of the greatest lyric poets of the classical age of Greece culture; it is after Homer and before he was properly written down. The principal guest of the affair is the great Simonides, Sim to his guest friends; his good guest friend and fellow poet Anacreon will be there; and of course the boy, his nephew and pupil Bacchylides will no doubt add a verse or two to the evening’s venue ends. As a special treat, it is rumored the Layra, the greatest hetaera of Athens will put in an appearance. She is said to hold games among select guests and will share her favor to the winner. She has been known to hold a computation for the best song when she wishes to see her friend Sim. She must love his soul, for it cannot, in fairness, be his face she loves. So open you favorite wine, pour it into a Greek kylix AKA cylix (preferably in the red figure style) share a small libation to Ms. Renault shade, and drink to days past and songs gown by. your entrances to his mystery. Part One: The appetizer will be the Keos (Ceos) years. Simonides will sing of his heartbreak as a youth condemned to labor on his father’s farm as a shepherd, when by chance, at a wedding feast, a bard will spot him, “swaying like Apollo’s sacred snake” to the wedding song. It is when he is apprenticed to his master and teacher that the appetizer turns from bitter too sweet, as whole of the ancient cultural world opened up to him. It is a true amuse a bouche fit for an Athenian king. Part Two: The soup course is set in the Samos years. The soup is served hot with, young Sim serving his master well in the Ionia city state colonies until the Persian Meads over salt the soup with war forcing them to flee to the island Samos. The Tyrant Polycrates receives them in Samos as refugees but does not employ them as he has already secured the services of Anacreon to sing his praise. Sim begins singing in a tavern to support himself and help his master. Anacreon befriends Sim and his master; both send Sim off with his brother to Delos to represent his home island Keos in a coral festival celebrating the birth of Apollo. Of course Sim wins the contest, however, when he returns to share his joy with his master he finds that Apollo has added the bitter herb of death by disease, and has claimed his master for the gods; the bitterness is in the drags of the wine that accompanied the soup dish. Sim accepts his ashes from philosopher, mystic, and mathematician friend of his master Pythagoras. His belief in the transmigration of the soul, what we today would call reincarnation, offers comfort to the grieving Sim as he departs back home to Keos. Part Three: The main course begins in Keos as the soup dish is withdrawn, the action moves to Athens for the next 14 years. Sim’s father endows Sim with a small self-sufficient farm as part of his patrimony. This is not to tie him to home so much as to provide him with a safety net in case misfortune should strike and to demonstrate family pride in his accomplishment as a poet. Sim strikes out to find his way in Athens and is taken up and given work by the Archon’s of Athens, Pisistratus and his two sons Hippias and Hipparchus. It was Pisistratus and his two sons that enforced rule of law set by the laws given by Solon that curbed the power of the oligarchs and aristocrats of noble lineage. As such they were popular tyrants having the support and love of the people. The aging father and the eldest son Hippias dealt with the meat and potatoes of government. It fell to the younger son Hipparchus to run the cultural events of the city, recruited the finest talent, and adorned the city proper. One might say he provided secrete sacred sauce that turned the meat and potatoes of government into an epicurean delight worthy of praise and reputation. However, tyranny is a wild meat dish and one has to watch closely to not keep the meat too long before it becomes unfit. Alas this happens when Hipparchus and his older brother inherent the power from their father. It took many years before the meat finally turned. Until then there was wine to drink, parties to have, court gossip to share, and above all praise to sing to the gods at public festivals. There is a charming fiction of the two Archons sending Sim to Samos by warship to collect his friend and fellow poet Anacreon following Polycrates murder by the Persian/Meads governor. Alas it was his greed and a false friend that were his undoing as the tyrant of Samos. There is another fiction when ugly Sim confided to his benefactor that he had been played and swindled by a mid-level harlot. He comforts Sim with a grand privet party where the finest hetaeri of the city is invited and Sim is set up with Layra the best of them all. The Archon neglected to mention she was expected to deliver to ugly Sim. No doubt this, his little joke, as his tastes ran to boys. No matter the Archon’s motives, it sparked a long and dear friendship between the two. Another blotch of mold is seen on the peach of tyranny when Sim discovers the trickster who swindled him and wounded his pride was seen years later with her back spoiled by the whip making her only fit to service galley rowers and slaves. The main course ends with a visit to Olympic Games. There is a foot race whose winner, Aristogeiton will appears later in the story. There is a grand chariot race with a third time win by the same team. There is court gossip with Layra in the women’s sector; and then an impious killing in the sacred grounds of the owner of the winning chariot team. Enemies put it out that the Archon’s Hippias and Hipparchus had had it done, however, there was no proof. Sim believes it is not in the two Archons nature to do such things. The victim was given a public burial at Olympus (a great honor) and his team sacrificed to his shade. Later their Charioteer that drove them was seen weeping inconsolably. Part Four: Is entitled, “The Sacred Way”. It opens with a time-marches’-on sentence but put much more pertly as if Sim sang it, “The years sailed on swiftly with fair winds. The wine dark sea lapped softly on the reef ahead.” The author speaks of the old Archon sons maintaining the good will of the people and how no one wanted to return to the days before Solon the law giver. Sim speaks of the cycles of the pageants, processions, feasts, games, celebrations, and sacred days to honor the gods, which make up the calendar of a poets work. The focus then shifts to his home island where he says, “I found my son, I found him and he found me. I took him in peace doing no wrong to anyone.” The son he speaks of is his nephew Bacchylides who also loved the muse. His brother and wife give consent for him to go with his uncle to Athens and Sim purchases him a pedagogue to see that his 9 year old charge keeps out of trouble while Sim is working. All Athens took him to be Sim’s illegitimate son. Sim did not deny it for the boy’s protection but when questioned never lied about it either. So the boy became as good a son to him as if it were true. The Archon Hipparchus privet parties became less refined and his friend Anacreon was relieved to be excused. Proxanious, an aristocrat, dies of a disease leaving a young son Harmodius and daughter Delicia. Aristogeiton reappears as Harmodius lover. With this, the table is set for the fall of an Archon. Sim gets a business opportunity to praise a horse race winner in Thessaly; there he makes great guest friends who will shelter him in later years. When he returns from Thessaly he finds restlessness at the court. Hippcrachus has changed his favored Ganymede, again! Anacreon shares the gossip that the Archon has set his eye on the young aristocrat Harmodius and was rebuffed. Sim is shamefully used by the Archon to publically insult Delicia, Harmodius sister for his rejection of the Archon lust. Sim observes, “The Archon’s sense of his deservedness had grown; now he believed what he desired, he deserved.” This was at the quadrennial offerings to Athena Parthenos, and to disturb her rights unjustly was sacrilege to the goddess. Sim’s enchantment with the Archon as a friend is broken. Events begin to snowball and the Panathenaea approached with Sim leading the choirs. Then Athena claimed her missing offering from Delicia with the assassination Hipparchus by the lovers Harmodius & Aristogeiton. Athenians will later praise their actions as Tyrannicide and they became the preeminent symbol of democracy to come. What of, “The Sacred Way” you ask? In the end it was the road along which the assassins ran to claim the goddess justice against the hubris of the Archon impiety; plunging their knives into his strawberry shaped heart. So my friends we come to the end of our meal finished with bitter dark chocolate of tragedy and a sharp sting of winters mint in a pool of the Archon’s strawberry sauce blood. Truly, events fit for a cautionary song of lament by Simonides. Epilog Reviewer Notes: Unlike “The Last of the Wine” or any of the Alexander trilogies this book does not have the great battles. Our protagonist, Sim, is a poet not a warrior. He is from a remote island and not an Athenian by birth. The audiobook is that of a memoir format told retrospectively by Simonides before his end at age 88. It gives the work a nostalgic tone. Politically this is a study of the tyrants, Polycrates of Samos, Pisistratus of Athens and his sons Hippias & Hipparchus. The view is up close and personal. It gives one a feel for the strengths and weakness of tyranny. Ultimately it is only as good and as enduring as the strengths and virtues of the tyrant himself. In the authors book “Mask of Apollo” she revisits the theme of tyrants and the concept of a philosopher king set in Syracuse who was a pupil of Plato. I look forward to the day when Audible will offer this work. Recommendation: this is a first rate study of political intrigue of tyrants and the domestic customs, manors, beliefs and innovations of the six & fifth century BCE. It is an age when lyric poets were fragile vessels of Greek culture written only on the poet’s minds. It foreshadows the development of theater and the great Greek drama, tragedies, and comedies that shaped western culture. It is not stated as her goal; however, I believe Ms. Renault’s writing style was deliberately more lyrical and poetic in homage to the poets in this work. I love the fact one can take the character and place names and look up the history she is writing about and find out there is a close match between the general story line and historical facts. Her genius knew where to flesh out the story with a novelist’s license while not violating the underlying bones of history. How can one not give this anything but thumbs-up. To do otherwise would be to paint fool upon ones brow. Masterful narration brings history to life! Would you listen to The Praise Singer again? Why? I have listened to this story several times - it was one my mother urged me for years to read. I have read Renault's Alexander series, and the Theseus books, but this book I'd begun several times, but never turned past the first pages; it did not grip me. I took a chance on it as an audiobook and it's one that I listen to when I have time for contemplation - there are layers. It is Tim Bentinck's voice that brings me back - the characterizations, the tone, the cadence, the humanity of his interpretation brings this alive for me. Renault's work makes one feel like it may not be necessary to read the Phillipics, Virgil, and Herodotus to understand the ancients. Through Google Earth I am able to stand on the roof of Delos and look around, and a quick look to the internet as I listen fleshes out Solon or Hipparchus as the tale unrolls. Simonides of Ceos is also the originator of the 'mind-palace' or method of loci practice of memorization, just one of the many wonderful tangents from this story! Which character – as performed by Tim Bentinck – was your favorite? Bentinck's treament of Simonides was so spot on for me that I went around looking for anything else narrated by him. He is my new John Lee; I want him to tell me every story. He lives the story more than he narrates it, making Simonides so human, so relatable. I'm grateful to have him for this story and hope he has more to give. Mary Renault's ability to bring ancient Greece to life never fails - I found the whole novel engaging, even with my attention difficulties. The narrator did a fantastic job with subtle voice changes for the different characters and giving that little bit of spice to every sentence. Wonderful experience all round.